Add video files to Playlists and activate the Campaign cycling option to alternate content in each loop. The easiest way of managing advertisements and making sure you get a varied content is having multiple Playlists on your device. 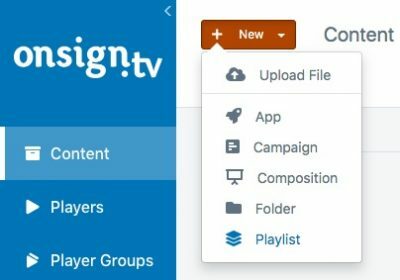 Another tip is grouping content by categories together and enabling Campaign cycling! In this tutorial, we show step by step how to create an ad Playlist and publish it to your device. On the content page of your OnSign TV Account, click on "New". Select “Playlist” from the menu. Fill out the Playlist details. For more info, check out the complete tutorial on how to create Playlists. At the bottom part of the page, you will be see two divisions: on the left, you can find all of your account's content, on the right side is the workspace where you organize the Playlist display sequence. Browse for the ads and drag them into the desired sequence. Set Campaign deadline. If you are advertising for a set period, define this by hovering the mouse over the ad and clicking on the “Edit Restriction” icon (gear icon). Apply time restrictions as well as a deadline so it won’t be displayed after that. Alternate ad display. On the top of the page, add a number in the “Campaign Cycling” field in order to display just a set number of ads at a time each turn of the Playlist in the Player Loop. Publish the Playlist to devices and add more filters if you wish. In this example, we have published this Playlist with video files to a Player which contains twp general campaigns. Each times the Playlist appears in the device loop, one ad is displayed since we set Campaign Cycling to "1".